AMSOIL Series 3000 100% Synthetic 5W-30 Diesel Oil delivers extraordinary lubrication in both diesel and gasoline engines found in commercial, fleet and personal vehicles. By combining the industry’s premier synthetic technology with AMSOIL premium additives, AMSOIL HDD exceeds the higher performance demands of modern engines. It withstands the stress of higher heat, higher acid levels and excessive soot loading found in EGR equipped engines. AMSOIL Series 3000 Synthetic 5W-30 Diesel Oil consistently outperforms conventional and synthetic diesel oils for long-lasting performance and protection. Series 3000 Improves Fuel Economy. Testing performed by an independent facility showed that class 8 trucks with AMSOIL Series 3000 in the engines and AMSOIL synthetic lubricants in the drive trains obtained up to 8.2 percent more mpg than matched trucks lubricated with conventional products. AMSOIL Synthetic 15W-40 Heavy Duty Diesel and Marine Oil has been proven superior to con­ventional oils in fleet demonstrations and countless miles of over-the-road use. AMSOIL Syn­thetic 15W-40 Heavy Duty Diesel and Marine Oil reduces wear rates, provides extended drain service and saves truckers significant money. For use in both diesel and gasoline engines. Ideal for applications where the extra protection of a higher-viscosity oil is desired. 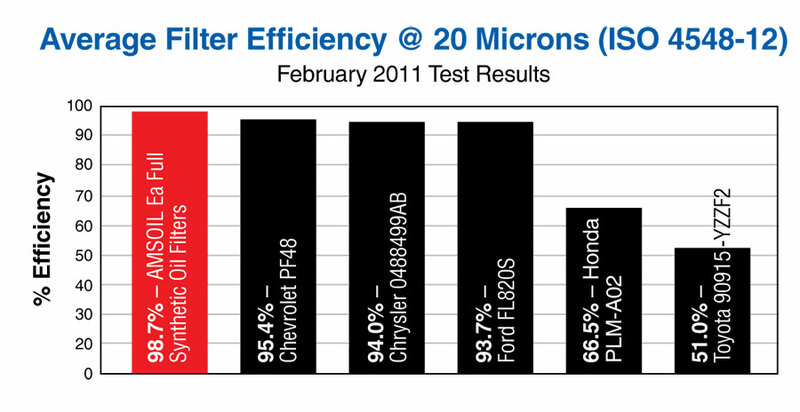 The higher viscosity may help reduce motor oil consumption in equipment experiencing higher than normal oil usage rates while running lower viscosity lubricants..
AMSOIL Ea Heavy-Duty Extended-Life Oil Filters provide excellent filtering efficiency and high levels of contaminant capacity for heavy-duty on and off-road gasoline and diesel applications. They provide extended service intervals that coincide with the maximum drain interval recommendations of AMSOIL synthetic motor oils (not to exceed one year), increasing convenience and reducing maintenance costs. 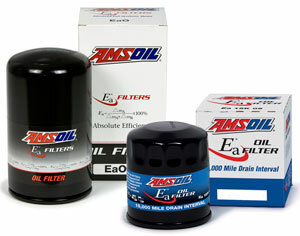 Ea Heavy-Duty filters offer AMSOIL quality at competitive prices. AMSOIL Ea By-Pass (EaBP) Filters provide higher filtering efficiency, soot removal and increased oil capacity due to new media composition and con­figuration. 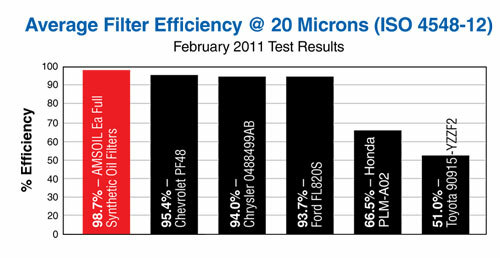 AMSOIL EaBP Filters have an efficiency of 98.7 percent at two microns. At normal operating RPMs the EaBP Filter will filter all of the oil in a typical five quart sump in less than 10 minutes. The superior construction of AMSOIL EaBP Filters provides better sealing and increased longevity along with superior corrosion resistance. AMSOIL offers filtration products for four-wheel drive vehicles from Donaldson®, a world leader in filtration. Donaldson Endurance™ filters provide the highest level of filtration efficiency in the industry. Endurance filters are made with advanced synthetic and nanofiber technology that results in fibers that have a controlled size, down to submicron diameters. It is this nanofiber technology that provides higher effi­ciency and greater capacity to better protect four-wheel drive vehicles. 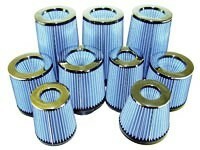 AMSOIL also carries premium air filters that utilize PowerCore filtration technology. The rugged structure of PowerCore filters features an innovative, layered, fluted filter media, which allows air to enter an open flute while forcing it out an adjacent flute, allowing only clean air into the engine. Dirty air is effectively filtered and cleaned in only one pass through the media. PowerCore filters are available for Ford 6.0/6.4L Power Stroke™ Diesel and GM H2 Hummer 6.0L Vortec™ four-wheel drive vehicles. 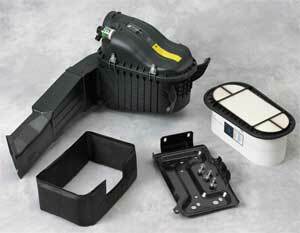 An air induction system for Ford 7.3L Power Stroke™ Diesels featuring PowerCore technology is available as well. 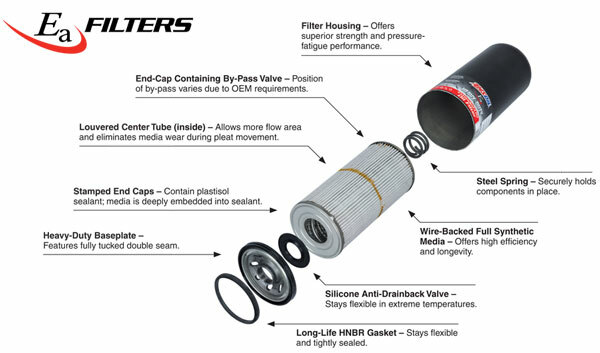 Designed to replace stock oil-wetted gauze or foam conical filters that were supplied with custom induction systems produced by K&N, Injen, S&B, Green, AIRAID, AFE, TrueFlow and more. Offer better efficiency, excellent airflow and are cleanable. AMSOIL offers premium filters that utilize PowerCore™ filtration technology for Ford 6.0/6.4L Diesel Power Stroke™, GM H2 Hummer 6.0L Vortec™ and 2006 – 2008, GM 6.6L Duramax Diesel, selected Freightliner, and John Deere applications. The rugged structure of PowerCore™ filters features an innovative, layered, fluted filter media, which allows air to enter an open flute while forcing it out an adjacent flute, allowing only clean air into the engine. Dirty air is effectively filtered and cleaned in only one pass through the media. AMSOIL now carries a retrofit air induction system kit for Ford truck owners who operate their vehicles in dirty or dusty conditions. 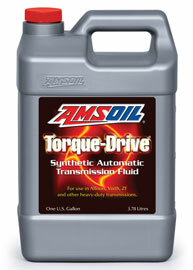 AMSOIL synthetic gear lubes deliver the rugged protection four-wheel drive differentials and manual transmissions need. AMSOIL Long Life Synthetic Gear Lubes, in the correct viscosity grades, are recommended for all domestic and foreign applications such as over-the-road trucks, light, medium and heavy-duty trucks, off-road equipment, commercial vehicles, motorhomes, autos, SUVs, emergency vehicles, busses, delivery/utility vehicles and tractors. 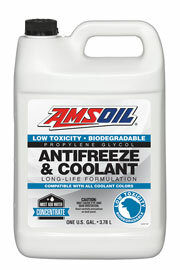 Engineered to eliminate the deficiencies common to all conventional, petroleum ATFs, AMSOIL Torque-Drive™ provides superior performance and protection against thermal and oxidative degradation, sludge and varnish formation, viscosity shear down, cold temperature oil thickening, poor friction stability, high component wear and shortened oil life. Automatic transmission operating expenses can be directly linked to transmission fluid quality. 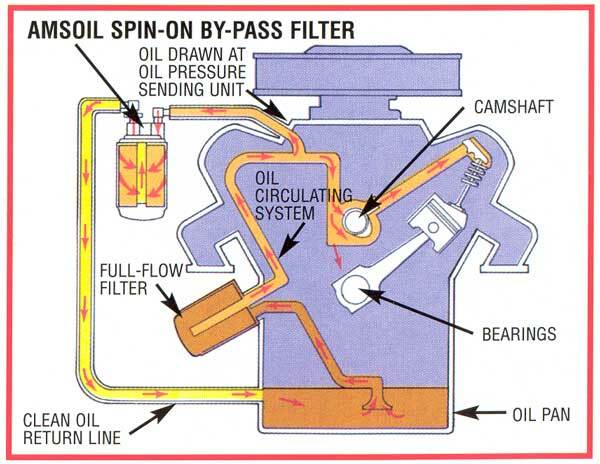 Poor quality oils need frequent changes and they reduce the effective service life of transmissions. Delivering the ultimate in oxidation resistance, wear control and friction performance. The protective lubricating film of AMSOIL synthetic greases coupled with robust extreme pressure additives makes metal-on-metal contact and premature wear a thing of the past, even during high load conditions. AMSOIL Synthetic Heavy Duty Grease contains ‘moly’ for extra protection of heavily loaded components, such as steering knuckles and spring shackles. Synthetic oils’ natural resistance to thermal and oxidative breakdown and their ability to keep temperatures from climbing excessively make AMSOIL synthetic greases ideal for high-temperature service. AMSOIL Series 2000 Synthetic Racing Grease com­bines the high temperature protection of a multi-purpose grease with the load-handling capabilities of a heavy-duty grease, making it ideal for the protection of all low and high speed components – steering knuckles, spring shackles, wheel bearings and more. 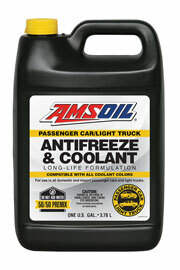 Use with AMSOIL Diesel Concentrate (ACF) to improve cold-weather performance in applications below 40°F. Lowers the cold filter plugging point by as much as 34°F and decreases the need for #1 diesel fuel that is diluted with kerosene. Contains jet-fuel-type deicer to help prevent ice formation in fuels that are contaminated with water.